The Gorky Automobile Factory (GAZ) was established in the early 1930s to produce Ford vehicles in the Soviet Union and developed a wide variety of vehicles prior to and after the Great Patriotic War. One foundation of their production was based upon the GAZ-AA 3 ton truck chassis which was based, in turn, on the Ford AA truck. 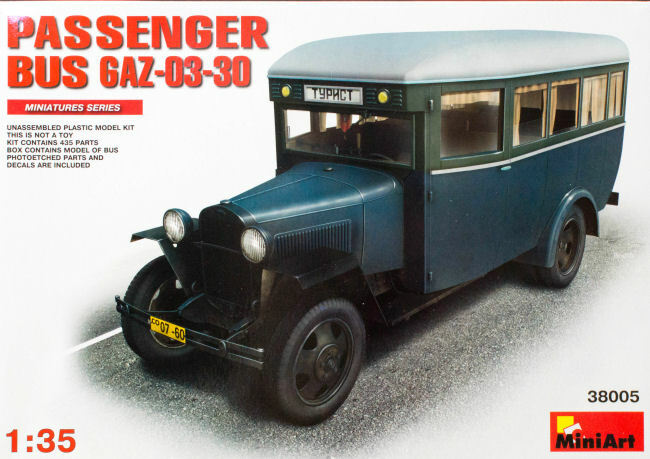 Using the GAZ-AA chassis, GAZ developed a 16-passenger bus which was designated GAZ-03-30. Many of these buses were produced before the war and production resumed again in 1945. Painting instructions are provided using MIG paints which may be of use to some modelers but paint equivalents using other (more readily available) paints would be more useful. 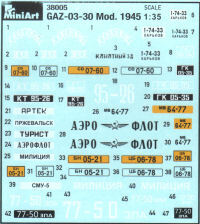 The color profiles included in the kit provide eight paint and marking options including a Minsk Police bus circa late 1940-1950s, a Sochi tourist bus, an Aeroflot crew bus circa 1946 and a variety of worker shuttle buses. MiniArt continues to develop interesting kit subjects long overlooked by other manufacturers. This latest release looks as nice as the tram kits produced a few years ago. If you want something different for a basic model or an interesting centerpiece for a diorama or vignette, get one of these bus kits! My sincere thanks to MiniArt for this review sample!